Libyan leader Colonel Muammar Gaddafi has vowed to fight till the death and die a martyr in his homeland, refusing to step down amid widespread anti-government protests. 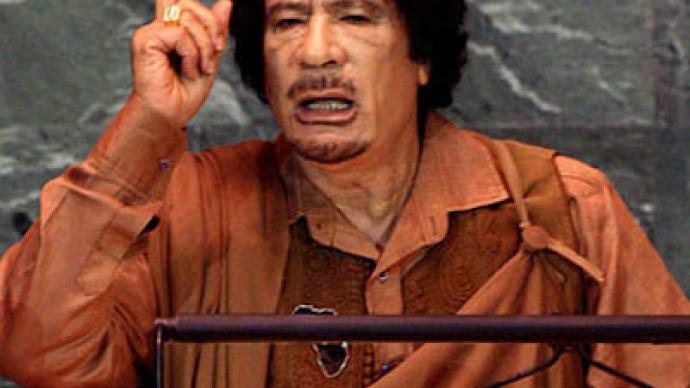 ­In his first major speech since the unrest began, Gaddafi talked of the "cowards and traitors" responsible, while referring to protesters as "rats". Gaddafi urged his supporters to take to the streets and attack the opposition, who he claimed was bribed, drugged and "serving the devil." However, Libyan interior minister Abdel Fattah Younes al Abidi defected on Tuesday and joined the protesters, calling on the army to follow and support the people's demands for change. Several Libyan ambassadors have also quit in protest over the use of force on civilians who are demanding the end of Gaddafi’s decades-long rule. The country’s leader reportedly ordered the army to use air strikes against the demonstrators – something he denies. Several hundred people have been killed and over 4,000 injured in the first week of violence, making it the bloodiest of all the Arab revolts. 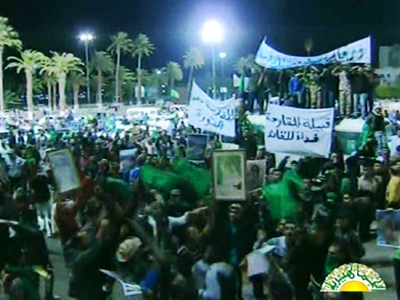 There are reports that 300 unarmed civilians have been killed in Libya's second largest city, Benghazi. France is pressing for the EU to cut all economic ties with Libya following the violent suppression of opposition protests. President Sarkozy says Europe should consider adopting a number of sanctions against Tripoli for what he calls a brutal violation of human rights. The proposed measures include barring those involved in the crackdown from entering European countries and monitoring their financial transactions. The UN Security Council demanded an end to the violence on Tuesday, while the Arab League suspended Libya from its ranks. 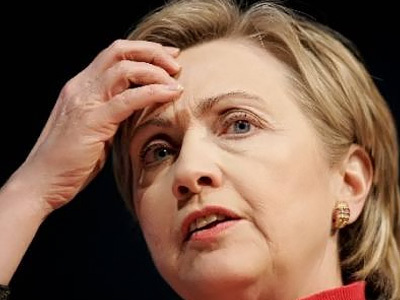 Earlier on Tuesday, US Secretary of State Hillary Clinton, in a statement made before press at the State Department, called on Gaddafi to take action to end violent protests in the country. Meanwhile, in Yemen, two anti-government protesters have been killed and dozens injured after supporters of the country's President opened fire outside a university in the capital, Saana. 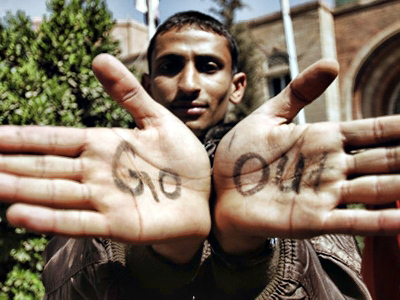 Tens of thousands have rallied across the country for two weeks, demanding the resignation of Ali Abdullah Saleh. Adil Shamoo from Baltimore-based Foreign Policy in Focus says that a dictator’s job is to remain in power and Gaddafi is no exception. 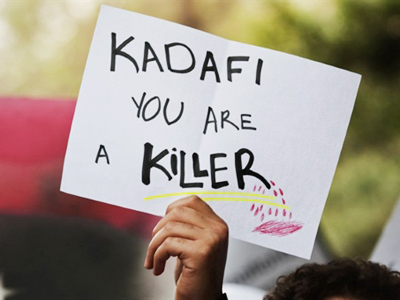 “[Gaddafi] has been in power for 42 years, he has been abusive, no freedom. The economy, despite its richness with oil, has gone down and that is why the people revolted against him,” Shamoo said. ­Former MI5 agent Annie Machon believes that the West is becoming increasingly powerless in the region, torn by protests and revolutions. “[The West] is realizing that perhaps its days of post-colonial hegemony are gone and there is a new generation of activists of protests who can make a difference, who can co-ordinate these sorts of activities,” she said. However, Machon says that with Gaddafi the situation may be slightly different. “After he had seen what happened to Saddam Hussein he did offer up what little technology he had, which may have been taking him to the situation where he had weapons of mass destruction. And then of course he was welcomed back into the international fold with open arms,” she said. ­The West does not have much influence in the unrest in the Middle East and North Africa, but it has huge interest in it because of oil supplies, believes James Walston, professor at the American University of Rome. “If things become problematic, it’s not just a problem for the West, it’s a problem for China, which gets its oil from there, and the rest of the world. So this could have major geopolitical repercussions throughout the world because of the energy and because of the religious factor, if Islamic radicals take over in some of the countries,” said Walston. Michael Hughes, a journalist with The Huffington Post from Seattle, thinks that recent developments in the Arab World are a sign of the decline of the American "Empire” and that “democratic movement has erupted despite American policy in the region”. 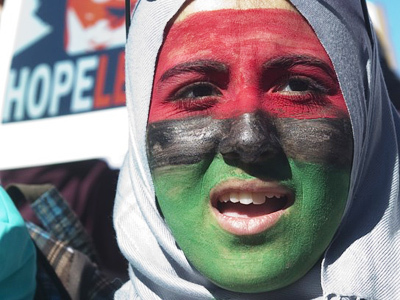 ­But Mahdi Darius Nazemroaya, a Research Associate from the Centre of Research on Globalisation thinks that the US is very much involved in the Libyan political crisis, and as in Egypt, pursues its own interests. ­Financial sanctions against Libya on the part of Europe are not effective, and European powers have to intervene for the safety of Libyans, and for their own good, believes Dr Rosemary Hollis from City University, London. “I’m suggesting that if they want good relations with whatever regime emerges in Libya, they need to be seen to have been on the side of that regime sooner than now. If they look like all they are going to do is sit back and wait for the Libyans to decide, then they are not ahead of the game,” said Hollis.